We received our Sigwalt Chicago No. 11 press with no chase so it has been sitting collecting dust for a while. I recently cobbled together a chase from a scrap of the ¾″-thick high-density polyethylene (HDPE) sheet we use to make our moulds and deckles. 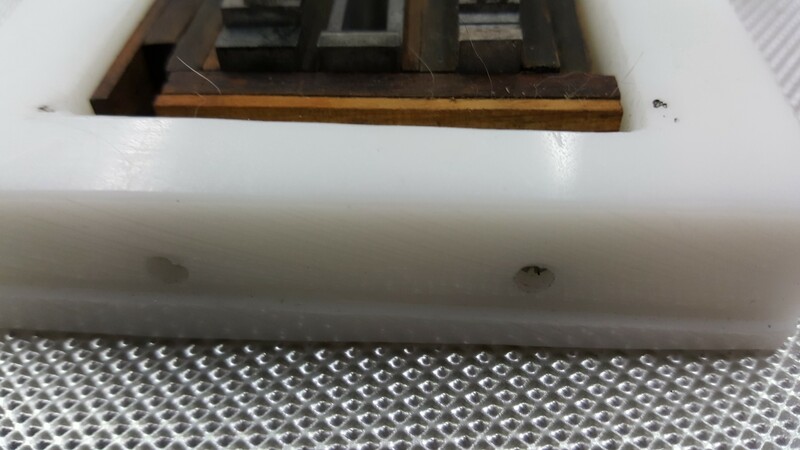 I cut the HDPE to a rectangle which fit closely between the rails of the press, then shaved off a bit on each side leaving a small wedge to engage the chase retainer lugs on either side of the bed. I cut the chase opening using my sabre saw, with a drilled hole to start the cut, and filed the edges to the desired shape (more or less). I drilled some holes on two sides and tapped them #8-32 to take setscrews to lock in the type. Locking screws in the side of the chase. Note also the wedge-shaped ridge which engages in the lugs on either side of the press bed. To test it, I locked in three lines of standing type I had waiting to be dissed (the title lines from a Wayzgoose Anthology submission from four years ago). After some fiddling with packing and the press bed adjustments I got a half-decent print out of it. 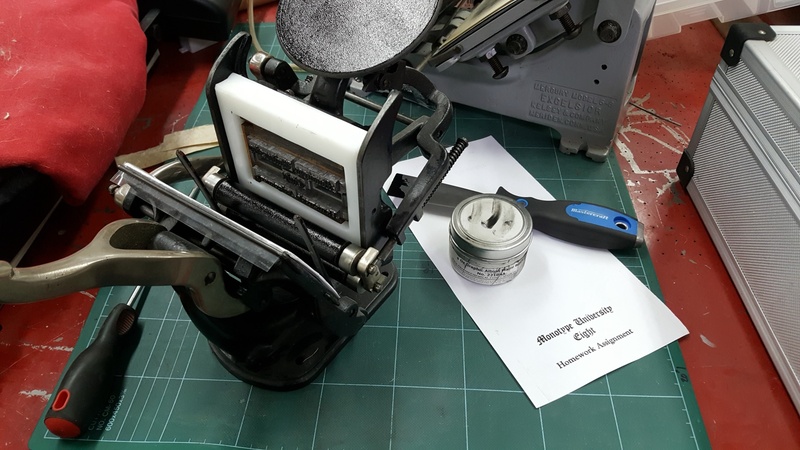 The rollers on this press seem really hard (Shore A45/OO90) for the strength of the roller saddle springs, and things ended up a bit over-inked. This press has a small foot so it really needs to be attached to a tabletop or larger base to avoid tipping when operating it. A bigger base plate and new ink rollers are the next items to be addressed for this press. Because I hand-shaped the opening, one end of it is a bit wonky so I put the setscrews in that end. The other screws ended up on the bottom of the chase purely by chance. I didn’t have the correct screw size handy so I made my own, and the slot in the head (cut with a hacksaw) is a bit too narrow to accept the screwdriver tip properly. Also, the screws have to be recessed so it takes a tiny screwdriver to tighten them. I think I will re-drill and re-tap the holes to accept the same screw size as those on the chase of our Kelsey press (which I think is ¼″-20) so I can use the same screwdriver that I use for the Kelsey. A genuine chase seems to be about 5/16″ thick on the top and bottom, and 7/32″ thick on the sides, so welding four sides together might be the easiest way, as long as I can keep the sides from distorting. Hey KP Martin! Any updates on your journey? I just picked up a sigwalt no. 11 myself, am Ontario based too! Would love to hear how the chase is coming along!